Welcome to the Best Western Plus Lackland Hotel & Suites! Whether you are coming to town to visit Lackland Air Base for graduation, Seaworld San Antonio or the downtown area, rest assured that guests at our San Antonio, TX hotel are minutes away from a world of fun. We're located at near the Lackland Air Force Base and the Wilford Hall Air Force Hospital. We cater to all service men and women, their loved ones and family. If you're here for military business, medical tourism or to visit a loved one who's stationed nearby, our friendly southern hospitality complements the best location in town to get to the base. Enjoy being close to the downtown River Walk, an area where a romantic stroll goes hand in hand with a little local exploration. We're just 10 miles away from the downtown shopping centers and Six Flags Fiesta Texas where legendary roller coasters await. Guests staying at our hotel in San Antonio, TX will be just five miles from SeaWorld San Antonio, two miles from Lackland Air Force Base and the Wilford Hall Medical Center, making all your commutes easy. Traveling is made simple when you're four miles from Port San Antonio, the military airport and 34 miles from Kelly Field. 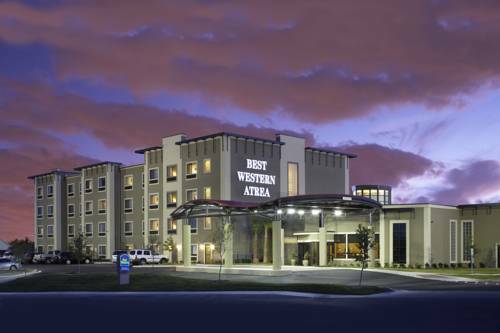 This Best Western San Antonio, TX hotel is designed with your comfort in mind. Located near South West Research Center, we have designed our rooms to be welcoming and comfortable. Enjoy a restful nights' sleep with luxury bedding, spacious rooms and updated amenities. No matter what brings you to the San Antonio, TX area, staying in a great location surrounded by the best attractions gets any trip off to a great start. Mix in some leisure with your business or plan the family vacation of a lifetime. Our helpful staff members are always on hand to help you map out your itinerary and make the most of your time. Book today and make the Best Western Plus Lackland Hotel & Suites your next home away from home! 1 mile(s) from Taqueria Vallarta, full service, Mexican, open for: breakfast, lunch, dinner, Mexican restaurant.